Them Digital are providers of Mac and PC integration services to businesses in Islington, surrounding areas and throughout Central London. We can integrate PCs to your Mac network or Macs to your PC network, giving your business greater flexibility, easier networking and file sharing and very possibly cost savings too. For any business or organisation located in Islington, EC1, or throughout Central and Greater London, Them Digital offers a responsive, local service that can not only integrate your PCs and Macs but provide ongoing support to ensure future Macs, PCs, printers, servers and other devices are correctly integrated. and Why is it Needed? Many companies use a combination of PCs and Macintosh computers within their business, that can possibly create a variety of problems including file sharing, networking and security issues. While it has always been possible to integrate PCs and Macs, many IT departments have lacked the combination of Mac and PC knowledge to carry out a successful integration, and as a result have recommended a "PC only" or "Mac only" policy. But many companies find this increasingly impractical and restrictive. Creative and media companies, such as those involved in advertising, branding, publishing and web design, require the capabilities of high spec Macs to operate specialist graphics applications, while their admin staff may need only basic word processing and spreadsheet capability to perform their work. Even outside this type of industry, many businesses simply find it too limiting to have to exclude one type of machine from their environment. Many companies therefore, at some point, decide that they want to be able to add PCs to their Mac environment or, more commonly, Macs to their PC environment. This presents a challenge to in-house technical staff who are often trained or familiar with either PCs or Macs, but not both. The result is often a piecemeal approach, where Macs work on one network and PCs on another, each with their own servers, because no-one quite knows how to integrate them fully. This results in frustration for employees wanting to share files between machines, and makes it difficult for businesses to implement computing policies consistently (e.g. security policies). It can also result in unnecessary expenditure on duplicate hardware such as servers and printers. For a company in the EC1 or Central London area, PC integration carried out by Them Digital offers the ideal solution. What Are The Benefits of Mac / PC Integration? Getting your PCs and Macs properly integrated offers several significant benefits. Integration makes your business more efficient, by allowing all your computers to talk to each other and share files easily. It results in commonality and consistency, which makes it far easier to organise maintenance and to track down problems if they occur. This means quicker resolution of problems and less disruption to your business overall. A common problem for companies is enforcing download policies to prevent contamination by viruses. This is fairly easy to do on a PC, but more difficult on a Mac as it involves setting admin settings correctly, which requires some knowledge in order to do consistently for all machines on a network. An integrated network also allows a single security policy to be applied to all machines on that network, such as logon procedures, password change frequency and so on. Other security features can be enforced across the whole network, such as firewalls and virus checking. Integration can also block Macs from accessing confidential information. Integration can also save you money. For instance, an integrated network requires a single data storage server to serve both Macs and PCs, rather than separate ones. It also means that the new machines can use existing printers, rather than needing to buy new ones. Many companies find that the cost of integration is offset by the various hardware savings that are possible, although this will vary depending on your particular setup. Why Use Them as Your Mac / PC Integration Provider? 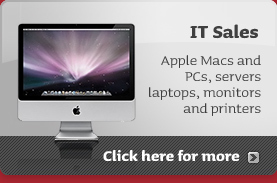 Some IT support companies specialise in PC support, while other specialise in Macs. At Them Digital we have equal expertise in both and specialise in Mac / PC Integration. We have conducted successful integration for many different clients, including VCCP and Barnado's, and are familiar not only with the technical issues, but also the typical business issues that integration has to solve. With more than 60 years combined experience, and a well earned reputation for expertise, commitment and a quick response, Them Digital have the experience and capability to carry out your office integration needs, as well as provide on-going support as your setup grows.